As a former news anchor, talk show host, and columnist, Ruth Ann Harnisch has long been fascinated with media’s ability to reach broader audiences, sway opinions, and affect public policy. She knows firsthand its role as a catalyst for social change. In 1998, Harnisch left her career in media for a life centered in giving. As the Founder and President of the Harnisch Foundation, she supports bold ideas, effective leaders, and creative communities working to advance gender equality. Headquartered in New York City, the foundation continues its commitment to film and media, journalism, and leadership. Harnisch is a longtime member of the TED community, and a founding funder of the TED Fellows Program. She is a funder of the Sundance Institute’s Women at Sundance initiative, designed to foster gender equality in American cinema, and she is one of the original Women Moving Millions members. She is an active funder with the Women Donors Network, a member of Rachel’s Network, and a mentor for the International Women’s Forum Fellows Program. 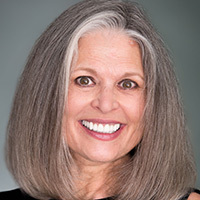 She is a founding funder of the Center for Sustainable Journalism at Kennesaw State University and the Institute of Coaching at Harvard Medical School's McLean Hospital. Harnisch is a contributing author of the Amazon-published anthology “Ten Habits of Highly Successful Women.” She was featured as one of “Forty over 40” women making an impact and Inside Philanthropy named her as one of 50 most powerful womenin U.S. philanthropy.